Don’t fool yourself that the innocent never go to jail. When Bob Chappell disappeared from his yacht, moored in the Derwent Estuary near the Royal Yacht Club of Tasmania’s marina, on the night of 26 January 2009, he left behind his pipe and tobacco — something that his partner of 18 years, Sue Neill-Fraser, knew he would never willingly do. What she didn’t know was that despite no body, no weapon, no cause of death, and no witnesses, she would soon become the only suspect in Chappell’s disappearance. But was the verdict unsafe? Many of Australia’s leading legal minds think so, and other reasonable hypotheses have been mooted about what might have happened on the Derwent that night. The Tasmanian government has changed its laws to give Neill-Fraser one last crack at proving her innocence, because that is what it’s come to now — proving her innocence. 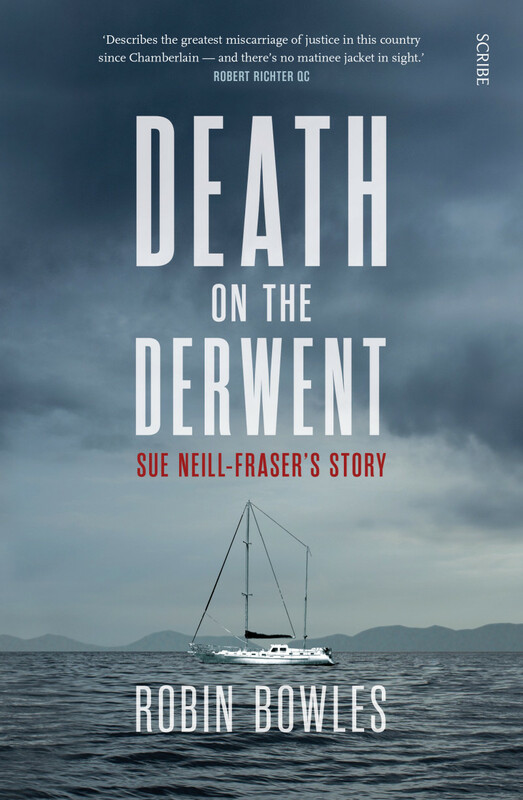 The result of years of investigation, and based on extensive interviews with all the key players — including Sue Neill-Fraser and her family, local underworld figures, and legal luminaries — Death on the Derwent is a riveting story of justice not served. On 26 January 2009 Bob Chappell spent the afternoon working on his yacht, the Four Winds, in the Derwent Estuary. He decided to sleep on the yacht overnight. As the sun rose over Hobart the next morning an alarm was raised from onshore: the 54-foot yacht was sinking, and there was no sign of Bob. When police took members of Bob’s family to the yacht, which was moored offshore, to look for signs of Bob his partner, Sue, pointed out a number of anomalies: ropes were coiled in an odd way, spanners were missing, a fire extinguisher had vanished – and so had the EPIRB (Emergency Position Indicating Radio Beacon). As always happens in police investigations Bob’s long-term partner, Sue Neill-Fraser, was thoroughly interviewed and checked out. She soon became the prime suspect in Bob’s disappearance and it was only months later that she was charged, put on trial and found guilty of murder. That should have been the end of the matter except that there were several people who were horrified that Sue was in jail. They believed the trial had overlooked key evidence and failed to explore why the DNA of a homeless 15-year-old girl was found on the yacht. There was a miscarriage of justice and nobody seemed to be doing anything about it. The case caught the attention of true crime writer, Robin Bowles. Robin has developed a well-earned reputation for being like a dog with a bone when she gets a sniff of injustice. You only have to read her book about the disappearance of Peter Falconio, Dead Centre, in which she argues passionately that Bradley Murdoch should not have been arrested, to know the lengths Robin will go to when she is investigating a crime. Death on the Derwent is a story told in three parts: the crime, the trial and the interplay of various key people. By the time I finished the first part of the book, the crime, I could see why police had arrested and charged Sue Neill-Fraser. She was the one who stood to gain financially if Bob died and she had told different people that her relationship with Bob was over. Sue lied to police, told them she had been shopping at Bunnings in the afternoon Bob was on the yacht. There is no CCTV evidence from Bunnings that Sue had been in the store. She later changed her story. She had a cut on her hand, which she explained away. She vacuumed her car, cleaned the dinghy that used to take her and Bob out to the Four Winds. On the evening that Bob stayed on the yacht (the first time this had ever happened) Sue walked down to the foreshore late at night, twice. At a little after 3am Sue dialled the number on her phone that would tell her if she had missed any calls. When police talked to Sue the following day she said, ‘We had a healthy relationship.’ Police noticed she spoke of Bob in the past tense. Sue told police that the yacht had previously been broken into and suggested that since they had recently purchased the yacht it may have been used in the past to transport drugs. Maybe the traffickers had come for their goods. Physical evidence is scant. Cut ropes, a cut wire that stopped the bilge pumps from working, a sawed through pipe that enabled water to leach into the yacht, the homeless girl’s DNA – and the DNA, found inside a rubber glove, of Bob’s son, Tim. Bob’s pipe and tobacco, which he never went without, were found on the yacht but there has never been a sighting of Bob since 26 January 2009 when Sue got in the dinghy and headed back to shore. The trial of Sue Neill-Fraser was insular and laser focussed on the woman police had arrested. Lawyers failed to introduce evidence that might cast reasonable doubt on Sue’s guilt. An excellent example of this is the dinghy. Crime scene officers sprayed it with luminol, a chemical that shows the presence of blood, and it gave a positive reaction. The prosecutor convinced the jury that this meant blood had been found in the dinghy. It was later, during an appeal, one of Australia’s foremost experts explained there was no blood evidence in the dinghy: luminol reacts with iron, which is why it’s a great presumptive test for blood, but iron is found in all manner of other things. The homeless girl whose DNA was found on the yacht was tracked down. She was elusive and unwilling to testify but she told friends that she and two men were on the yacht that night. They went there to rob the yacht and were surprised to find the old man and ‘there was a fight’. This didn’t come out in the first trial and it’s appalling that police were so narrow in their focus that they didn’t explore this more thoroughly, didn’t track down this girl or the several witnesses who saw people on the foreshore that night, or the ones who saw a different dinghy tied to the Four Winds. After reading Death on the Derwent I’m still not sure what happened. Robin Bowles has applied her tenacity and her determination to expose miscarriages of justice to this case and revealed deep fracture lines in the trial of Sue Neill-Fraser. Robin highlights the Establishment in Tasmania, its unique culture. She explores the limits of the legal system, the power plays and internal politics in a way that shakes one’s belief in the purity of the justice system. Did she convince me that Sue Neill-Fraser is innocent? No. Did she plant the seeds of reasonable doubt, seeds that should see a jury put the brakes on a guilty plea? Absolutely.